As our newer projects come in, our previous monthly projects can be found here, because they are just too good to go away! Over the years we have been privileged to see so many wonderfully creative projects brought to fruition by the teachers we honor every year. In order to help nurture the community of sharing and growing that they foster every day, we would like to highlight a different project every month, and share it with the larger teaching community. Please come back often, and build and expand on what you see, to help enhance the lives of all children. I was very excited to win the Terri Lynne Lokoff National Child Care Teacher Award. The items I purchased for my classroom helped to improve active learning in my classroom. In the morning during free play I get out the wrist ribbons and giant true tone chimes. The children love playing with the wrist ribbons while dancing and listening to music. During our morning group time I enjoy getting the class started by turning on our good morning exercise cd. The cd has a lot of fun music and activities to get the kids moving and ready for the day. During this time we also use the get moving activity mats. This allows the children to have fun while using the exercise cd. On the days the weather does not permit us to be outside, I am able to bring the outside into our classroom with some of the items I received with my award. 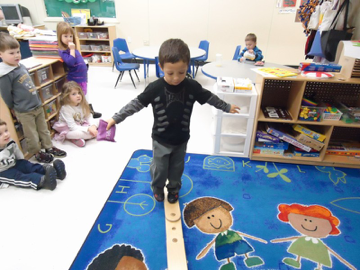 We use the balance board and the balance beam along with the balance and flexibility kit. The kids love making up their own games while using these fantastic indoor gross motor activities. The absolute favorite of the classroom, be it indoors or outdoors, has to be the partner parachute. The children love putting objects on the parachute and then watching how high they can get the items to fly into the sky. I am very appreciative for the award and the items have had a positive impact on my classroom. I thank you for picking me for this award and hope others can benefit just like my classroom has! Year-Round Healthy Growing - Our Greenhouse was assembled and up and running by early April, with the help of the Terri Lynne Lokoff Foundations amazingly generous grant. I spent $464 on the greenhouse, with another $168 on supplies and the first batch of seeds. Later I invested in an outdoor sink/wash station for the children to use after their potting and plantings. The children started a variety of seeds that will encourage and promote healthy eating. They planted lettuce, kale, carrots, radishes, cauliflower, broccoli, tomatoes, green and hot peppers, pumpkins, and celery. In working on this project and seeking advice from the grower’s community here in Casper; I learned that, ideally, greenhouses don’t operate until late Summer- early Fall. With that in mind, we moved even quicker to get it up and growing so that we would be able to plant the initial sprouts but are looking forward to planting later in the season for vegetables that the children and their families can enjoy throughout the Winter and colder months. Here it is, almost 2 full months later and our gardens are growing wonderfully. With the children’s attentions and careful watering skills, Quentin (4) and Lane (1) are demonstrating their watering mastery. They each are learning what the plants need to grow big and strong and healthy are water, sunlight and healthy food… which they agree, is exactly what they need to grow big and strong and healthy too! Families are more aware of what they are eating, and the value and importance of growing their own and eating more vegetables, hugely thanks to their children and the lessons and activities that we have been sharing since the greenhouse project began. Another aspect of this has been the sense of community that the gardens and the greenhouse have inspired amongst the children and their families is truly awesome. They come and check their plantings and to chat with their peers. Parents of their children’s classmates were introduced during the planting party that we hosted. Now they come to not only share their child’s day, but to talk with their friends also. This is a fact that the children love, everyone is working together and has expanded on our community, by adding a network of parents that are working together and helping each other out. When I look back at the beginning of this endeavor, I think ‘WoW!’ it’s amazing what a little extra support can do ~ and then you compound it to include the children, their families and everyone that they share the news and information with. The Terri Lynne Lokoff Foundation and all of their wonderful staff and supporters truly deserve the biggest and warmest of ‘Thanks!’ that we can give them. The Listening Center has enhancement our educational program by allowing all the children the opportunity to listen to different books. With the purchase of our listening center we were able to get a cd/tape player, with 4 headphones, storage rack, 4 books with cd’s and 2 sounds games. We borrowed books with tapes from our local library and resource room (NIM). We received our listening center package around May. We were all excited as a group opening everything up. The listening center has enhanced our classroom by allowing the children to listen to their favorite stories independently. It has allowed the children to share holding the book and taking turns. We have an animal and alphabet sounds games that the children listen to without earphones. The Childspace Orange room, Thanks You for our Listening Center, it has really enhanced our curriculum. To enhance my infant classroom, I received a light table, wooden blocks with transparent colored middles, a set of transparent colored toys, a box of colored scarves, and a mirror cube. The light table is on the floor and all of the children can reach it. The young children just beginning to sit on their own to the children who climb on top of the table have all enjoyed exploring and discovering what they can do with light, transparency, opaqueness, shadows, and colors. The children enjoy seeing how the colors brighten when put on the table. I continually stack things to mix colors, but the children just enjoy experimenting with the blocks, toys, and scarves. They pile, build, stack, look through, and examine the pieces. The investigation continues when opaque toys are added. The light table has exceeded my expectations. It is played with every day. I didn’t expect it to remain so popular after two months, but the children love it! I thought the mirror cube would be great for the younger infants when they were on the floor. Mirror play improves their visual tracking, cognitive, physical, social/emotional, language, and adaptive skills through discovering faces and reflections. However, this has not been the case. Once in a while I am able to use it with the younger infants, but the majority of the time the mirror cube is being pushed around the room by the beginning walkers. They use it as a walker stopping for short periods to peer and admire themselves in the mirror. It is the cutest thing! Overall I believe the items I received have enhanced my classroom. The children love playing and exploring with them. They have exceeded my expectations for how I had envisioned they would be used. The children play with them every day. How could I ask for anything more?